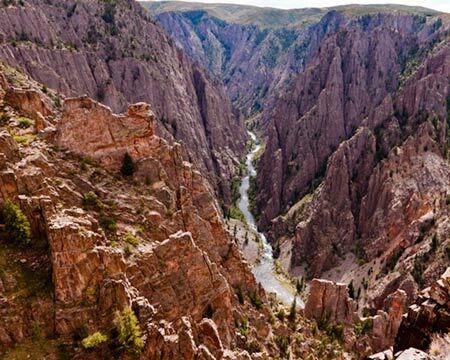 The Black Canyon of the Gunnison is a long (48 miles), deep , narrow (40 feet at the river at the narrowest point) canyon cut by the Gunnison River. 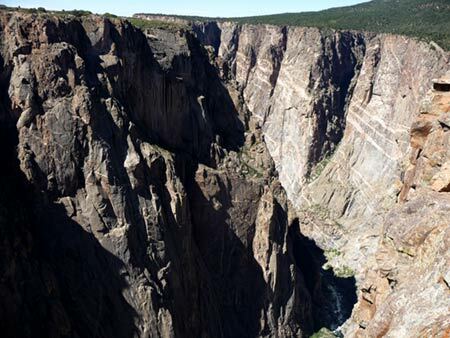 Because it is so narrow and deep, it is different from any other canyon we've visited. The whole experience here was very different from that of the rest of the trip. 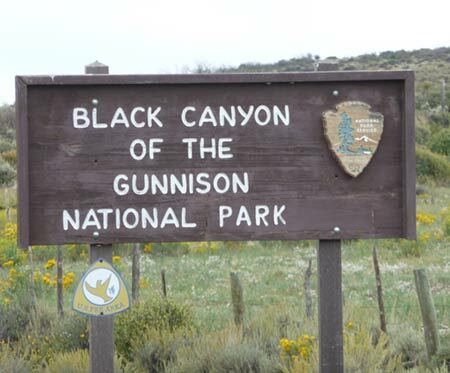 My wife was happy to learn that to quote the Park Service There are no poisonous snakes at Black Canyon of the Gunnison National Park. Nighttime temperatures are too cold for many species of snakes and amphibians. Although I'm not sure she is really convinced. 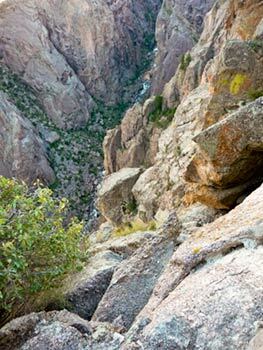 The South Rim of the Black Canyon is the most developed part of the park and the most accessible. 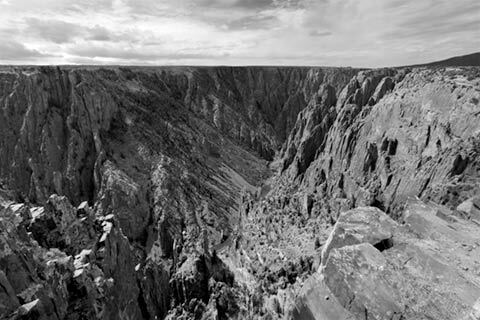 Developed is a relative term for the Black Canyon National Park. There is an excellent visitors' center, a few restrooms at various overlooks, and a campground. There are no food, lodging, gas, or other services in the park. Water is available from mid May to October. So unless you want to camp, you need to stay in one of the nearby communities. The South Rim campground even has RV electrical hookups. So if we ever wanted to bring our RV out west (highly unlikely), we would have all the comforts of home. One of the things we noticed on this trip was that everyone seems to have an RV and public (state or US owned) places to setup an RV seemed to be more numerous than in other places we've visited. Or perhaps since we now have an RV we're more conscious of RV friendly places. 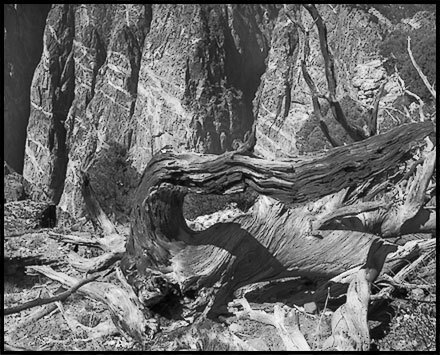 The North Rim is not as well developed nor as easy to get to as the South Rim. We visited the South Rim on our first day in the Park and then drove to the North Rim on the second day. 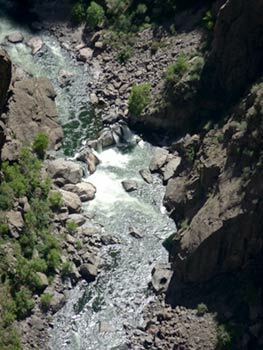 A significant fraction of the water in the Gunnison, as was the case for most rivers in the west, was diverted by early farmers in the area. The story of how the river was surveyed and the diversion project was accomplished is covered in the South Rim Visitor Center. It is amazing what the early settlers were able to accomplish with man and horse power. The area that is now highly productive farmland would be desert if the early settlers hadn't found a way to divert the river. I have to admire what they accomplished--but I'd love to see what the river in the canyon was like before it was diverted. We spent quite a bit of time in the excellent visitors' center and then spent the rest of our time driving along the rim to the various overlooks to view the canyon. We thought about driving down to the river, but decided that we didn't want to deal with the 16% grade on the road down to the river. 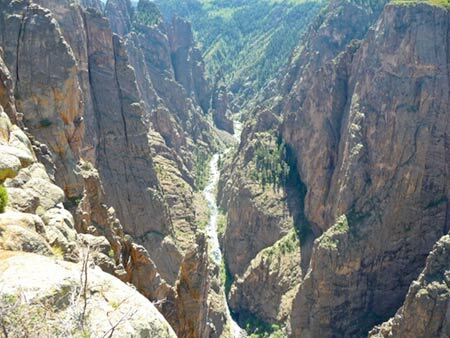 You can get a good view of the river at the bottom of the canyon from most of the overlooks. Even with the reduced flow in the river, the rapids look quite rough. We had a great day visiting the South Rim. 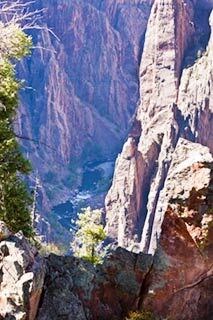 So we drove to Montrose for the night and got ready for our next day on the North Rim. 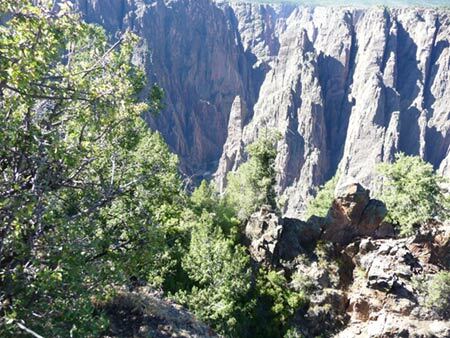 As I said above, the North Rim of the Black Canyon is less accessible than is the south rim. 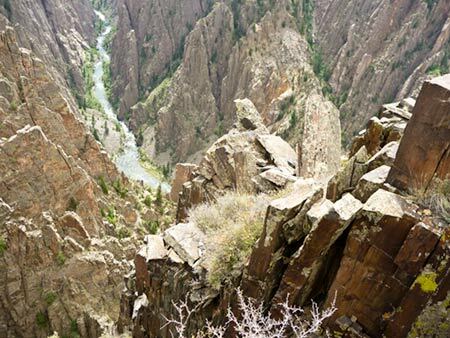 We started out in Montrose and had to drive over 50 miles to get to the dirt road leading to the North Rim of the Black Canyon of the Gunnison. Then it was another 11 miles on the dirt road to get to the park. The only development at the North Rim is a ranger station with restroom, and a campground (with no accessible campsites). The campground has no RV hookups and limited water. So you're pretty much on your own--take what you need in terms of food, water, and fuel. 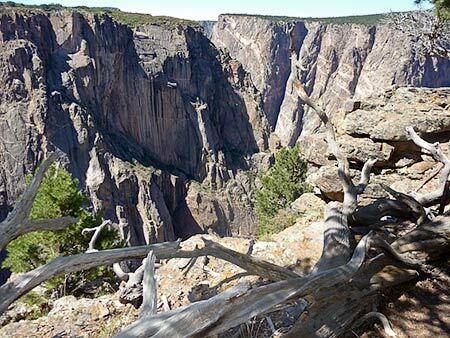 The views of the canyon from the North Rim emphasize the steepness of the canyon more than the views from the South Rim. 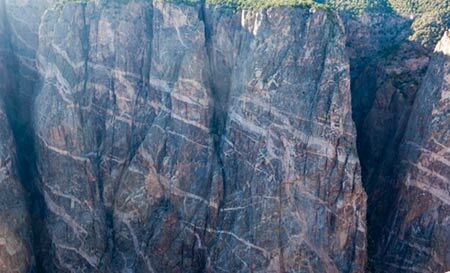 We thought that it was easier to see the canyon from the North Rim than from the South Rim. But you should visit both rims. 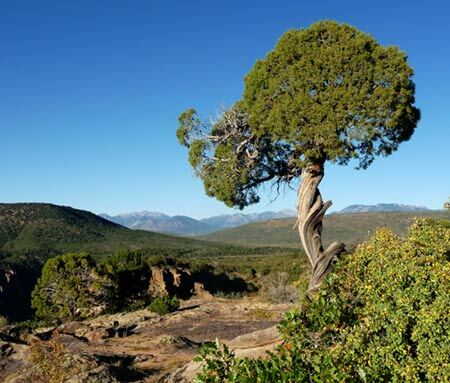 After we completed our visit of the North Rim, we headed west for Fruita, a small town just west of Grand Junction. We were able to make a quick trip through the Colorado National Monument on our way from Grand Junction to Fruita. Travels with Nessie Home :: Site Map:: Contact webmaster@ncsparks.com-email us:: Copyright Leslie Sparks 2006, 2007, 2008, 2009, 2010, 2011, 2012,2013,2019:: Last modified: October 18 2017.